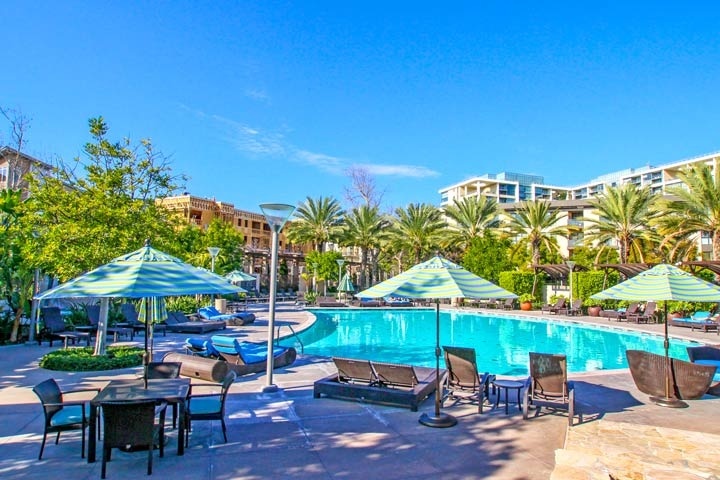 The Astoria condo complex is located in the Central Park West community in Irvine, California. The condos are located at 401 Rockefeller and were built between 2008 to 2010 and feature one to two bedroom condos that range in size from 1,119 to 2,752 square feet of living space. The complex sits next to the 405 freeway and in the northeast section of the Central Park West area. The Astoria condos are under a homeowners association with two monthly association dues required. The dues include 24 hour valet service, concierge, fitness center, wine room, a resort style pool at the Central Park West clubhouse as pictured above. This a prime area of Irvine near Newport Beach and the John Wayne airport. Below are all the available Astoria condos for sale and for lease in Irvine, California. Please contact us at 888-990-7111 with questions regarding this complex and any of the condos listed for sale here.